She has a background in 4-H, and through one show she is undefeated. West Virginia University freshman Erin Murray (right) poses with Mountaineer Head Coach Michele Koury after earning her second blue ribbon of the day. Finleyville, PA - Even though their Cacchione rider graduated last May, the West Virginia Mountaineers did not miss a beat on Sunday, clobbering the field with 38 points and a seventeen point victory over their closest rival, the Pitt Panthers. Leading the way for the Mountaineers was freshman Erin Murray, the lone undergraduate rider at today's show with two firsts. From Warrenton, Virginia, Murray had the honor of winning consecutive novice classes, though it should be noted that there was an hour-long lunch break between her fences and flat rounds. West Virginia junior Jennifer Blacker won her open fences and placed third on the flat to take a slim early lead in the Region 3 Cacchione/Open Rider Standings. 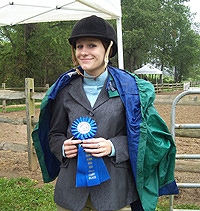 Teammate Kayla Fisher was second in both open divisions while yet another Mountaineer, Megan Cavan, won the open flat. These three riders hold down the top three places in the open rider standings through one show. Freshman intermediate rider Jackie Boyczek won in her only ride, placing first in intermediate flat to give West Virginia five blue ribbons on the day to go with five red ones. She was not feeling her best, and she even had to jump the intermediate fences during the brief heavy rains. Nevertheless Allegheny freshman Erin Smith won her jumping class and placed second on the flat, securing Reserve High Point Rider honors in her IHSA debut. Freshman did very well in the early going, winning six consecutive classes after Blacker's blue in open fences. Allegheny freshman Erin Smith made her IHSA debut while under the weather. Smith had to endure the rain during her jumping (five of the nine intermediate riders took their turn while the drops fell) and in spite of this and a bad cough the freshman from nearby Peter's Township, PA was a winner. Later, under VERY sunny skies Smith earned a second in intermediate flat, becoming the only Region 3 rider on this day with a first and a second and thus the reserve high point rider overall. Another freshman to win during this frosh winning streak was Michael McLean from Penn State's Behrend campus. From Syracuse, NY McLean won the first of two sections of novice fences, earning seven of Behrend's ten points in the process. 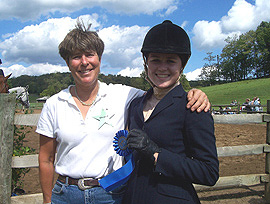 University of Pittsburgh freshman Caitlyn Webber won the first section of walk-trot, becoming the sixth and final freshman to win a class. Webber's seven points would make up a third of the Pittsburgh total, which made the Panthers the reserve high point team with 21 points. Also winning classes for Pittsburgh were Adriana Van Sickle, a sophomore novice flat rider making her IHSA debut, and Megan Walters, who was seventh at Zone 3 Zones in walk-trot her last time out. Walters was best in a field of eight beginner walk-trot-canter riders this time. Pittsburgh's Adriana Van Sickle was one of two riders from Peter's Township, PA to win in their IHSA debut during the September 24th show. For the first time in Pittsburgh team history, the Panthers were not the host at Mingo Creek Stables, as the Region 3 alumni put on the show. Prior to today's show the University of Pittsburgh had been the only school ever to host a show at Mingo Creek Farm. Though there were only six alumni competing at today's show it was the Region 3 alumni who were the hosts. 2004 Pittsburgh graduate Lauren Holmes (who won both alumni divisions to start the day) praised Penn State - Fayette graduates Rachelle Henderson and Beka Rugola for their fund-raising efforts. 2002 Edinboro University graduate Laura Hetz was also praised by Holmes for her work. Behrend alumni riders Lindsay Snyder and Kyra Durinsky rounded out the alumni who were constantly in motion doing something throughout the day. Returning to the scoring, Bethany College finished third for the day with 19 points. The Bison swept the advanced walk-trot-canter division, as Ashley Iwaniec, Courtenay Summers and Lindsay Walsh all earned blue ribbons. Walsh, a transfer from Post University in Connecticut, may have pointed into novice with her first. Allegheny and Edinboro tied for fourth place. While Smith led Allegheny, Kielan Williams led Edinboro with a first in walk-trot. Though not a freshman, Williams was one of at least eleven riders to be making either their IHSA debut or Region 3 debut to win a class at Mingo Creek on this day. In contrast, only four riders who competed as undergraduates within the region last season were able to leave with blue ribbons in their hunt coat pockets. The second walk-trot class proved to be problematic for some, but not for Kielan Williams (right). 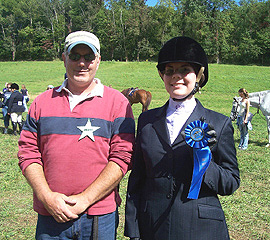 Edinboro Head Coach Lew Trumble (left) posed with Williams after her debut IHSA ride resulted in a blue ribbon. California of Pennsylvania and Washington & Jefferson tied for sixth with 12 points each. Kaley Jones earned third place ribbons in both intermediate flat and novice fences for CUP while teammate Shelby Nester was third in walk-trot. Washington & Jefferson had only three riders competing on this day (only West Virginia and Bethany had full cards). Elaina Sendro earned the highest ribbon for the Presidents with a second in advanced walk-trot-canter. Penn State at Behrend and Slippery Rock both scored 10 points. Kelsey Bova scored the remaining Behrend points with a fourth in advanced walk-trot-canter while Slippery Rock junior Andrea Meyer was yet another of the many Region 3 riders debuting with a blue ribbon. Meyer won the second section of intermediate flat while freshman teammate Amy Watt was second over intermediate fences and fourth in the first section of intermediate flat. Westminster College scored six points, with Aiden Mewha earning five of them with a third in open fences and a sixth in open flat. The Mercyhurst team, better known at the moment as intermediate rider Carlin Kelly, scored five points (three on the flat, two over fences). Clarion University scored three points in what may be their IHSA debut. Kim Schreckengost placed fifth in advanced walk-trot-canter while teammate Samantha Reynolds earned their first point with a sixth in novice flat. Alex Petro's fifth in walk-trot produced the only points of the day for Penn State's Fayette campus. Though not present today, Seton Hill is expected to compete in future shows while Saint Vincents' College will join the region after a year traveling east as part of Zone 3, Region 1. Even the red ribbons were generally won by those with no IHSA history. 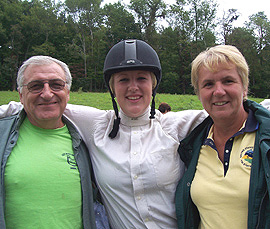 Slippery Rock freshman Amy Watt posed with her parents before placing second in a field of nine intermediate fences riders. When the show was completed, two things were apparent. One is that the Region 3 Alumni can put on a show as well as anybody and that West Virginia is clearly the best team in the region. 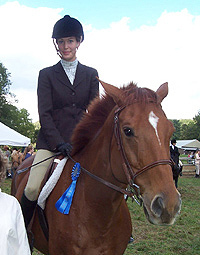 Though notable riders such as 2006 Region 3 Cacchione rider Mary Markvan have graduated, the Mountaineers appear to have more than enough returning and incoming talent. Though most teams are a close-knit bunch, the camaraderie among the West Virginia riders indicated they are pretty relaxed, and yet at the same time confident that they can win shows on a regular basis. Though Blacker, Fisher and Cavan demonstrated they are more than capable of winning open level classes in 2006-07 Head Coach Michele Koury indicated that one other open rider - yet another freshman - was competing in a recognized horse show on this day and would make her first appearance at a Region 3 show next week. It would not surprise this writer in the least if West Virginia won their region by a wider margin that a year ago. Only two of the Mountaineers twelve opponents on this day scored even half as many points as they did, and runner-up Pittsburgh scored 21 without an intermediate fences rider. Region 3 hosts Zone 3 Zones this coming April and the potential high point teams from the other three regions should take note of the Mountaineers as their likely competitor. Show Incidentals: Overcast skies early, then heavy rain followed by sunny skies and temperatures in the upper '70's. Start time: 9:18AM. Finish: 2:58PM - Includes a 69 minute lunch break/coaches & captains meeting. Point cards posted in this region? Yes. Alumni Classes held in this region? Yes. Judge: Andrew Lomker. Stewards: Koury/West Virginia University, Trumble/Edinboro University/Penn State University - Behrend and Bloom/University of Pittsburgh/Penn State University - Fayette. Team Totals: West Virginia University (High Point) 38; University of Pittsburgh (Reserve) 21; Bethany College 19; Allegheny College 16; Edinboro University 16; California University of Pennsylvania 12; Washington & Jefferson College 12; Penn State University at Behrend (The Behrend College) 10; Slippery Rock University 10; Westminster College 6; Mercyhurst College 5, Clarion University 3 and Penn State University at Fayette 2.